Harry and Sandy Johnson’s eighth bike and barge trip was destined to be a special one, joining their similarly boat and bike-loving friends who had chartered the Sarah, along with their respective adult children and partners, and other close friends and relatives. Their wish for the week: giving their children a shared experience of the wonderful cycling in Holland. “As the crew on the Sarah would attest, the collegiality aboard the ship was immediate and set the tone for the week,” recalls Harry. With a party that “fell into laughter and hugs upon boarding”, the trip had a relaxed atmosphere and crew focused on what they do best. 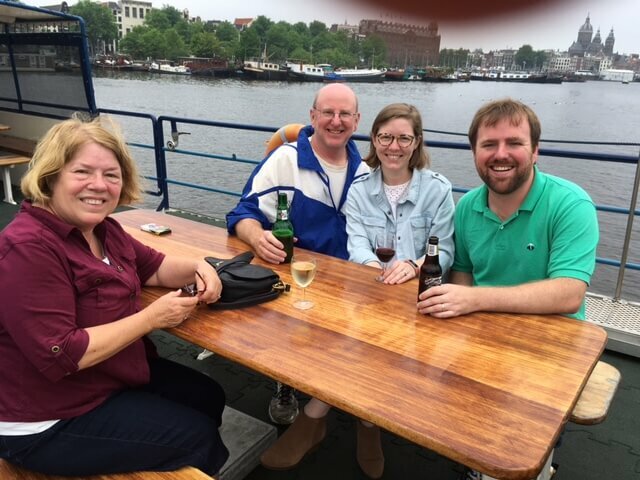 Having been on so many previous boat bike tours, the Johnson’s party rejoiced over serendipitous meetings with their previous guides from trips dating all the way back to 2005. As their tour wound its way through lovely Dutch landscapes from Amsterdam to Maastricht, Harry says the group was also impressed with how their guides dealt with circumstances way beyond their control as adventure struck, “as Ilsa did with the flooding in France in 2016, and Lia did this summer with an unexpected ferry strike”. What’s more, the flexibility of the tours allowed the group to cater for differing levels of biking ability, with a few people who were not prepared to ride the full distance every day welcoming the option of enjoying the day on board the barge. “One of our friends did opt for an electric-assist bike, and that proved to be crucial in his ability to ride every day and stay up with the group,” adds Harry. And the highlight of the trip? “I don’t know if there was one thing that impressed me the most. I would hazard to guess if this same question was asked of those who have never been on a bike and barge trip, the most impressive thing would be the simple, seemingly endless beauty of the countryside and the infrastructure that allowed them to safely experience it on two wheels.